After 5 years of construction, the new $1.7 billion 40 kilometre, four-lane Hunter Expressway (M15) opened on 22 March 2014. And from Newcastle and Port Stephens – the saving is up to 30 minutes! Take the Harbour Bridge or Harbour Tunnel north following the signs to “North Coast & Newcastle”. At Wahroonga (Approx 30 minutes from Sydney), turn right onto the M1 motorway heading for “Newcastle”. 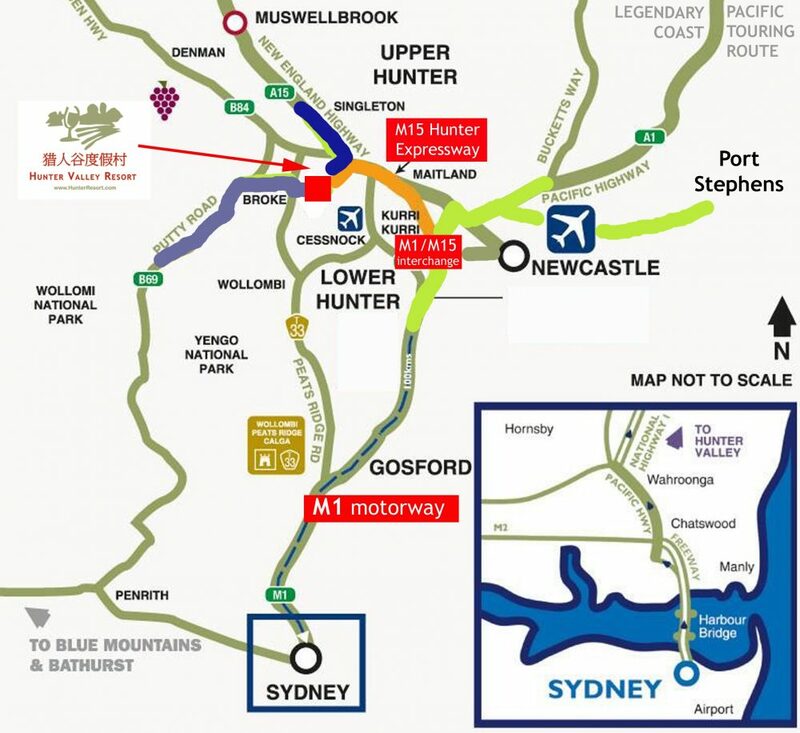 Follow the Freeway for approximately one hour, and then take the M15 Hunter Expressway towards Singleton at the Newcastle Link Road interchange. Follow Hermitage Road for approximately 9kms and turn left into Hunter Valley Resort at the corner of Mistletoe Lane. Continue along (A15) through Singleton towards Branxton. Approximately 10 minutes after Singleton, turn right into Hermitage Road. This road is marked “Pokolbin & Vineyards”. Hunter Valley Resort is located approximately 9 kilometres in on the left hand side on the corner of Mistletoe Lane and Hermitage Road. Following Newcastle Link Road from Newcastle towards M1 motorway to Sydney. At the main (M1) motorway interchange, go straight ahead onto the M15 Hunter Expressway and follow signs for towards ‘Singleton’. After approximately 30 minutes on the (M15) Hunter Expressway take the Hermitage Road exit. Following (A1) cross the Hunter River bridge at Hexham, follow the signs towards Sydney. At the main (M1) motorway roundabout, go straight ahead onto John Renshaw Drive (B68) and follow signs for the M15 Hunter Expressway. After approximately 15 minutes on the John Renshaw Drive (B68) enter the roundabout and take the M15 Hunter Expressway towards Singleton. After approximately 20 minutes on the (M15) Hunter Expressway take the Hermitage Road exit. From the Great Western Highway at Katoomba Railway Station, cross the line at the roundabout and turn right (Towards Sydney). Proceed down the mountains through Leura, Wentworth Falls, Lawson etc. to Springwood (About 30kms) and take a left hand turn at the Richmond/Winmalee turnoff. This road will make a north-easterly descent of the escarpment, along the Nepean River, past Yarramundi to Agnes Banks. Take a left turn towards Richmond. The road skirts around Richmond, then passes the Royal Australian Air Force Base, and proceeds to Windsor. At the major T intersection at the eastern end of the town of Windsor, turn left and follow the signs to Singleton. You will cross the Hawkesbury River, and follow Route 69 through Wilberforce, then onto Colo Heights. This road is called Singleton Road, and will take you north through the Wollemi National Park to The Hunter Valley. At Milbrodale, watch for signs to “Broke”. Turn right into the road heading for Broke. At Broke, turn right, then immediately left into Broke Road heading toward to Cessnock. You will pass the Singleton Army Base on your left hand side. Approximately 10 minutes from Broke, turn left into Hermitage Road. 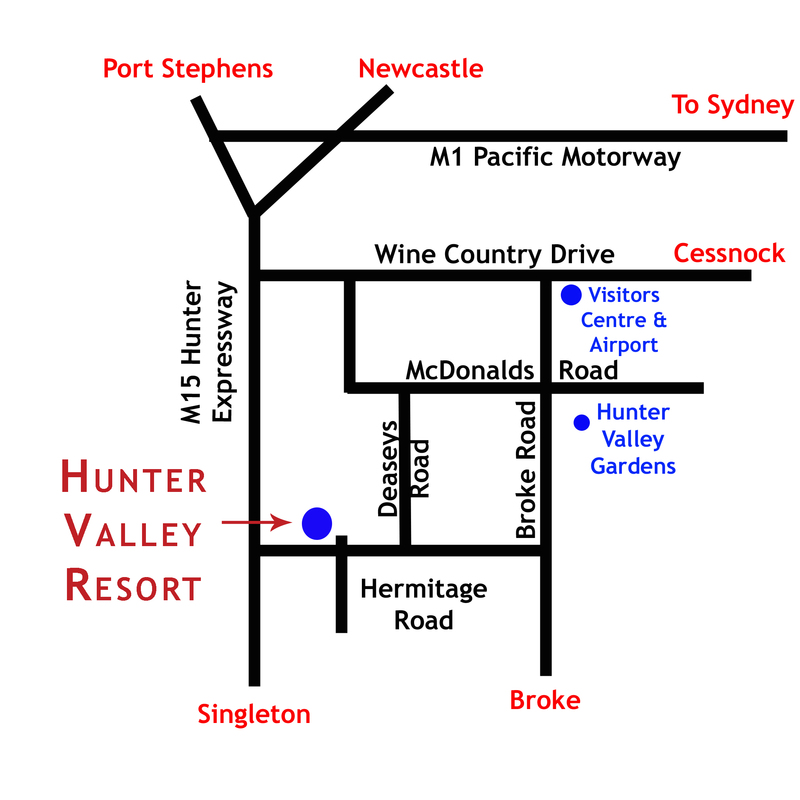 Hunter Resort is on the right hand side at the corner of Hermitage Road and Mistletoe Lane.